Looking to brighten up the road and get rid of that ugly yellow hue your factory bulbs give off? Plasmaglow headlights are a fast and effective solution. 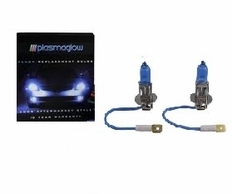 Plasmaglow Blue headlight bulbs fit your stock wiring harness, meaning no modifications are needed. Simply unplug your factory headlight bulbs and plug the Plasmaglow Blue xenon headlight bulbs in their place. You'll enjoy a "cool Blue", which is white with a touch of Blue light that is far superior to your factory bulb output. These Blue Plasmaglow headlights are of top quality and are DOT approved unlike many other brands on the market. Who else besides Plasmaglow offers a 10 year warranty? Be sure to order the correct size bulbs for your vehicle. If you are not sure which size bulbs your vehicle uses, consult your vehicle owners manual, or the application guide below. Price is for a pair. Make sure you order the correct size bulbs! Consult the Application Guide to determine which bulbs you need.